A simple reply would be long enough to reach your opponent. Stupid answer, I know… But the question is also stupid… sort of. Let me explain. The sword should be of the correct measure, with the pommel just under the arm , as here is written. To avoid any hindrance: the pommel should be round to fit the closed hand do this and you won’t be in troubles. And know for sure that the handle should be a span long, use other measures and you’ll be confused. Judging from this it would seem as if most modern sparring longsword are quite a bit too short. Why then do we see so many seemingly longer longswords in the fechtbuchen and in Renaissance paintings? Part of the explanation may be the simple fact that people were a little shorter back then. Not as much as the modern myth would have it, but a couple of inches, a little depending on the time period and social status. Looking at the period in question, after about 1350-1600, even common people had good access to proteins through meat, since the Black Death actually lead to a labour shortage and raised wages, after having eradicated almost half of Europe’s population. This means that both the poor peasants and the burghers alike didn’t suffer from a lack of protein and thus grew in length as a direct result. Still, looking at statistics, men in general were about 2 inches shorter in the Middle Ages. Interestingly enough, people in Europe were the shortest in the 19th century, due to malnutrition and other food associated factors. This is also when people start having really bad teeth, due to use of sugar…Something which was rather unusual in the Middle Ages and the Renaissance. Another reason may be that many swordsmiths base their designs on shorter war swords or swords intended for other civilian uses that required swifter response against sudden attacks or in crowded space; swords not specifically for judicial duelling or “school fencing”. As such, they are simply not representative of what we study. Another explanation could be that training swords were intentionally made longer in order to make the underlying fencing principles “clearer”. Of course, many swords of war were also of a similar length, but there is a certain logic to this explanation. Finally, for some modern swordsmiths it may also be a question of economy and practicality, where longer swords require more work, more space and therefore also in part different tools. Some modern swordsmiths have perhaps adapted to a common standard that doesn’t properly reflect the historical context we study. It is hard to know for sure. The only thing we can be certain of is the fact that a large portion of the illustrations show longswords that are proportionally a good four or five inches longer. Well according to those with bigger swords, yes indeedy. It does. Several Eastern European HEMA clubs like Gesellschaft Lichtenawers and Fechtschule Gdansk have picked up on this and have begun working with considerably longer longswords with a length of about 135cm for a fencer that is 180cm tall. Also a few Swedish fencers have done the same. The impressions they have shared claim that the fencing techniques and principles become much clearer. Just thinking theoretically about this change in proportions between man and weapon, this both changes the distance handling, the available time to react and also how the bind works. – A common problem with short and light swords is that it is almost as fast to strike around as it is to work from the bind, which makes the “Drei Wunder” more or less obsolete. With longer, and somewhat slower swords, it makes more sense to remain in the bind and work from there. Based on the images shown above, and others not listed yet, I think that this warrants some consideration and exploration. 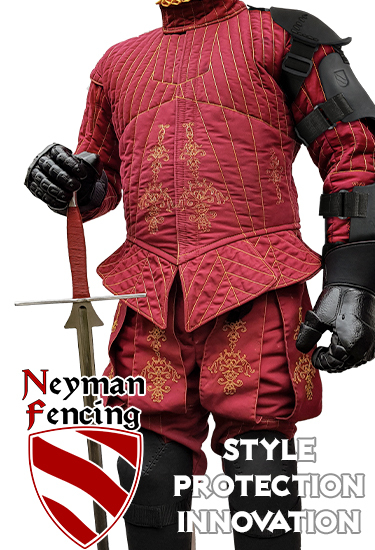 Personally, I am waiting to receive a sword of this length, but I would appreciate any comments from other fencers and will happily add them to this article. Feb 8 2011 – I noticed that the Wikipedia article on federschwert actually lists their average length at 132cm. I have no idea on what grounds this is based, but it is interesting. If this suggestion is valid, it might reinforce my theory on practice swords commonly being a bit longer than civilian and military sharps. Furthermore this document describes an Übungschwert which has a blade of 95,8cm, a hilt of 17,8cm, a total length of 130,5cm and a weight of 1384gr. This is the fechtschwert which currently resides in the Landesmuseum in Zürich. It is also the fechtschwert upon which Hanwei based theirs. Here is another picture of a practice longsword taken from Camillo Agrippa’s 1553 manuscript. Another suggestion I have seen, is that the particular shape of the fechtschwert with a flared ricasso is a relative of the “extra” cross seen on many 16th and early 17th century bidenhänder, and even suggestions that fechtschwerte were made by grinding down used up sharp swords. I have seen little to support this notion, but, then I came across this image from GA Lovino from 1580 which adds some credibility to the thesis. These Italian two-handed swords shown in Lovino are quite similar to this one, that currently resides in the collection of the the New York Met. The two hand sword as it is used now and & daies being fower handfulls in the handle, or more, hauing also the great crosse, was found out, to the end it should be handled one to one at an equall match, as other weapons, of which I haue intreated. But because one may with it (as a galleon among many gallies) resist many Swordes, or other weapons: Therefore in the warres, it is used to be placed neere unto the Ensigne or Auncient, for the defence thereof, because, being of it selfe hable to contend with manie, it may better sauegard the same. And it is accustomed to be carried in the Citie, aswell by night as by day, when it so chaunceth that a few are constrayned to withstand a great manie. And because his waight and bignes, requires great strength, therefore those onelie are allotted to the handling thereof, which are mightie and bigge to behould, great and stronge in bodie, of stoute and valiant courage. Who (foreasmuch as they are to incounter manie, and to the end they may strike the more safelie, and amase them with the furie of the Sword) do altogether vse to deliuer great edge blowes, downe right and reversed, fetching a full circle, or compasse therein, staying them selues sometimes upon one foote, sometimes on the other, vtterlie neglecting to thrust, and perswading themselves that the thrust serueth to amaze one man onelie, but those edge blowes are of force to incounter many. It should be noted that this is diGrassi’s advise on fighting with the two-handed sword only when outnumbered. His advise on single combat is quite different, not least in the common use of single-hand thrusts. With this in mind, it would seem logical to at least in part practice with training swords that behave similarly to the large two-handed swords. Another clue to the connection between the fencing guilds and the city guards may be the elusive flail that is shown in illustrations of fechtschulen, but never really discussed properly in any fechtbuchen. Comparing to the Stammbuch of Simon Von Haendel, it seems as if the flail was used by the city guard, at least in certain cities of late 16th Germany. Finally, there are also indications that there were connections between the practice of the 16th and early 17th century fencing guilds and the infamous doppelsöldners of the Landsknechte, which of course are tightly associated with the use of the bidenhänder. In the image selection above I have tried to work with images that I have deemed to be more realistically drawn than other manuscripts, thus making them somewhat more reliable in the sense that they show above average consistency in portrayal of swords. But to be “fair”, I have also cross-referenced to manuscripts of a “lower” quality, ie less realism and less attention to detail. Based on this, a notable exception to the above is the remarkable anonymous Codex.1.6.2.4, which bears much resemblance to several of Paulus Hector Mair’s manuscripts. Here the “feder-longswords” vary in length reaching only to the waist, to up to the armpit. The same goes for Paulus Hector Mair’s 1550 manuscript, Joachim Meyer’s 1560 manuscript and the Jörg Wilhalm manuscript. However, looking at ms.0963 from 1538, the Glasgow-fechtbuch E.1939.65.341 of 1508, the Christian Egonolph manuscript, Paulus Hector Mair’s manuscript of 1542, Joachim Meyer’s of 1560 and several more, further reinforces the argument that our sparring swords should be a bit longer than we generally use. Here is another interesting detail from a larger image by Franz Isaac Brun dating to about the mid 1500s. It shows Landsknechten practicing with dussacken, pikes and “fechtschwert”, just as in the manuscripts of Mair and Meyer. Particularly interesting is the length of the sword, which although being partly obscured can be assumed to be of substantial length, and the “nagel” of the dussack, something we usually associate with the messer. True, the men look like hobbits, which appears to be part of the illustrator’s style, but the image is interesting nevertheless. Although there is a certain variation in length of the longswords in the various sources I have looked at, there appears to be a dominance for longer longswords. Furthermore there is also a clear dominance for the so called “fechtschwert” in the Renaissance sources of the late 15th and the 16th century. PreviousHow do you grip a sword? NextHow do you do the Vom Tag? A proper long sword should measure from the feet(ground) up to the armpit of the user. Of you want a Great sword, that is usually from the feet up to above the users head. Also keep in mind that people of this era were shorter than people we see every day in this era. So to us, they would seem a bit shorter. Black smiths used to measure the user before making their weapons. Those who refused to b measured usually weren’t happy with the product, especially nobility, and would either punish them, kill them, or if merciful, let them redo it. I have yet to figure out the length determination of a short sword. Not quite sure if this is a spam post or real, as some clever spam bots sample other forum posts making them quite believable. Also, this comment mostly says things that are already discussed in the article. As for the last part about the nobility punishing the swordsmiths I would really like to see a proper source for that. Could you please share such sources? This article is already a bit dated, especially since we have more and more data on the training swords used in the Renaissance. However, there is no general length for a “proper long sword” as such so one can’t say that a longsword has to reach into the armpit. It can vary wildly. Still, for training purposes, there appears to be a more common proportion between the body & sword, which still is valid in the article above. How does this article hold up to a survey of historical samples? Great article! To be honest, although it is only about three years old it is already getting old, as we learn more things. I still believe it is generally correct though, although it may be different for specific contexts, locations and times. The article though focused primarily on what is seen in some treatises and those are certainly in line with plenty of historical samples, not least the fechtschwerter used for training, which I believe are related to the Zweihänder.